Having just finished a month long Kickstarter campaign, I haven't come back to Earth as of yet. It's the strangest feeling in the world, as you've just spent a month refreshing and refreshing, answering questions, promoting like mad, refreshing some more and watching your total go up then down, then hopefully back up again. It's a torture that you would only wish on your worst enemies, yet we put ourselves through it over and over. The notes below are based off of multiple campaigns that I've been a part of. Some were run by me directly, others I was part of a group, and some I was just there to assist. Some succeeded and others failed miserably. Most lost money. 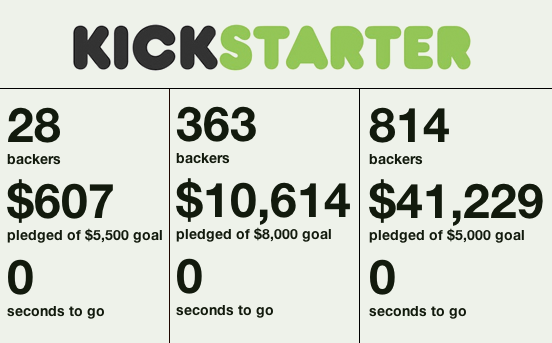 But with all that in mind, Kickstarter is a wonderful tool for creative people. It's a somewhat unpredictable tool, but there are a few things that you should know before using it. 1. You Need To Plan, Plan, Plan. Planning is the most important thing as it's the backbone of your campaign. You need to research all of your costs because chances are, you will lose money. Many project creators that meet their goal or even those who go above their goal lose money in the end. Shipping is a huge part of this. You need to ship from the manufacturer to you and then from you to the backers. If you take too long to deliver your product, shipping rates may raise during that time. (this happened just recently and can cripple a small business). If your project meets its goal with time to spare, you may offer stretch goals giving more content to your backers. It's very easy to get caught up in the momentum of Kickstarter and offer stretch goals that aren't researched thoroughly and wind up costing more money than intended. There is so much to plan. 2. Promoting Will Consume Your Life. As crazy as it sounds, having a failed Kickstarter project is one of the best ways to learn. I've done it and learned so much from my own mistakes. With a board game project I learned that backers want solid art, first and foremost. Without it, they may not even click on your project. That could be extended to any project type, as backers want an impressive presentation. I also learned that backers want good and exciting rewards. Having your reward levels consist of 1 copy of your product, 2 copies, 3 copies, etc... is not exciting at all. Having a reward structure where each reward improves on the reward just before it, encourages backers to upgrade their pledges. And finally, I learned that I didn't have the following to get the 300 backers I would need to break even. So you need to have a good customer base before you click that launch button. Obviously some projects break the mold and succeed with no promotion, bad art, and no following, but you can't only look at the breakout projects. Look at the ones that just hit their number and see what they did right. And if you haven't failed yourself, look at the projects that did fail, and see what they did wrong. It'll really stand out and make you think about your approach.